Goto is serious about his farm-to-fork. Not only is the beef local (Hawaii Ranchers red veal; Kahua Ranch Wagyu beef), but so are all the trimmings: Kekela Farms baby greens; Nakano Farms tomatoes; Hawaii Island Goat Dairy chèvre; Hamakua mushrooms. The cows are pasture-raised, the meat is hormone- and antibiotic-free. The produce is locally grown, and the goat cheese is from a local goat dairy. Chef Goto understands the importance of supporting local agriculture here on the Big Island, and stays true to his values. Even the brioche buns are from a local bakery, baking buns especially for Village Burger using Chef Goto’s own recipe. You can really taste the difference! 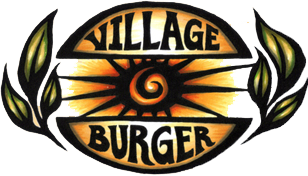 And if you aren’t a meat eater, try the Hamakua mushroom burger, the ahi burger or the taro burger.